against these common ‘ectoparasites’. The problem is that there are so many different products on the market today, making it hard to know which one to choose for your pet and which is going to be safe for your cat, dog, guinea pig etc. Unfortunately in the emergency room we commonly see the effects that can occur when pet owners get it wrong. It is important to remember though that if your ‘Fido’ and ‘Fluffy’ are joined at the hip, that this can increase Fluffy’s chance of permethrin toxicity. 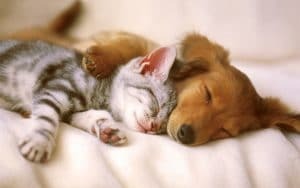 If you place the topical treatment onto the dog and the cat is in close contact or commonly grooms your dog, your cat could also become exposed to the treatment and quickly regret their close friendship. 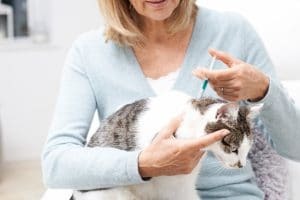 So what should you do if your cat starts showing these signs or you realise that you have made the mistake of medicating the cat with the wrong product? 1) If no signs have appeared or they are still mild – such as increased drooling – you can attempt to decontaminate the fur at home by giving your cat a bath in warm water with dish detergent. Permethrin is an oil based compound and so detergent is the best way to remove it from the fur. 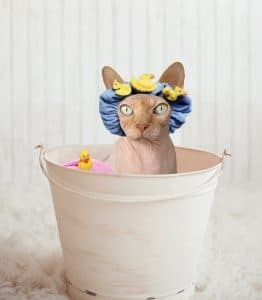 NOTE: if your cat hates water, don’t attempt this decontamination at home as you will likely be quickly introduced to the sharper side of your beloved pet and regret the outcome. Instead, bring them straight down to your vet so that they can do the decontamination for you. We’re used to the sharp bits. 2) If your pet has started to show further signs please bring them straight down for assessment by your vet or one of our emergency vets after hours, as by this point they will likely need further treatment. The products that are safe to use on cats and kittens will usually have a cat on the label and state that they are safe for cats. Topical products for cats will usually contain the ingredients ‘fipronil’ or ‘pyrethrin’ (different from permethrin so read carefully). Pyrethrins do have the potential to cause the same toxic effects in cats but this is very uncommon if they are used according to the manufacturers directions as they are not present in high enough concentrations. However, if your cat is sensitive to the compound, exposed to a larger concentration or ingests a topical product then the potential for the same clinical signs to occur does exist. The best thing to do to avoid permethrin toxicity in your cat is to read the ingredients of any product before using it on your pet and closely follow the manufacturers instructions. 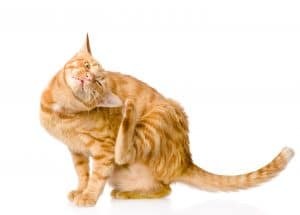 If you are unsure or concerned about which products to use for your feline friends, please discuss your options with your regular veterinarian as they can create a parasite control plan for you that is safe for your furry family members and works for your budget and family routine. If you have questions after hours do not hesitate to call The Animal Emergency Service and we can advise you if the product is safe for your cat.